In his prime, Jack Nicklaus was known as a member of professional golf’s Big Three, with Arnold Palmer and Gary Player. 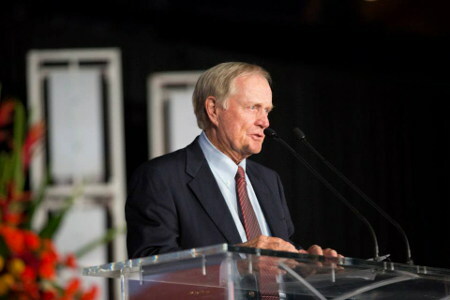 Nicklaus expanded that group to a Big Five when he joined in honoring Utah residents Billy Casper and Johnny Miller during the annual Governor’s State of Sport Awards at EnergySolutions Arena last month. Casper, of Mapleton, and Miller, who lives in the Heber Valley, received Lifetime Achievement awards during the event staged by the Utah Sports Commission. Casper, 82, was unable to attend, due to health reasons. Casper won 51 tournaments on the PGA Tour, including the 1959 and 1966 U.S. Opens and the 1970 Masters. Miller’s 25 titles included the 1973 U.S. Open and the 1976 British Open. In a 13-month stretch in 1974–75, he won 11 tournaments. “Johnny, probably for the period of time when he was hot, he was the best golfer on the planet,” Nicklaus said. Joined by one of his sons, Nicklaus played nearly every year in the Champions Challenge, staged by Miller at Thanksgiving Point in Lehi from 1998 to 2009. Casper and his son, Bob, won the inaugural event. If not for having Casper honored with him and Nicklaus appearing as a featured guest, Miller “wouldn’t have been overly interested” in the awards program, he said. Miller, 67, described them as “the two most important people to me in the game of golf,” among his fellow pros.